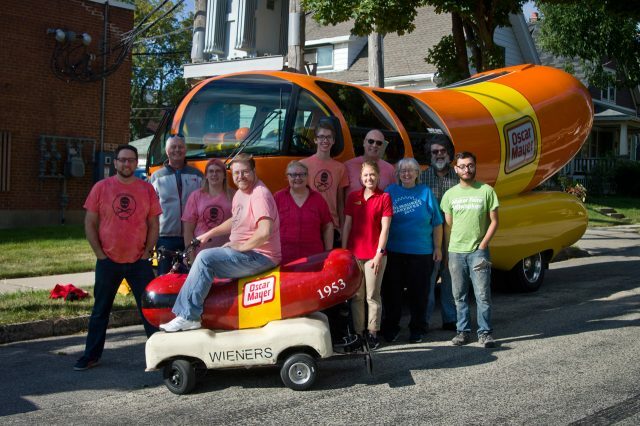 And that’s how the Oscar Mayer Wienermobile came to visit Milwaukee Makerspace on September 1st, 2017. 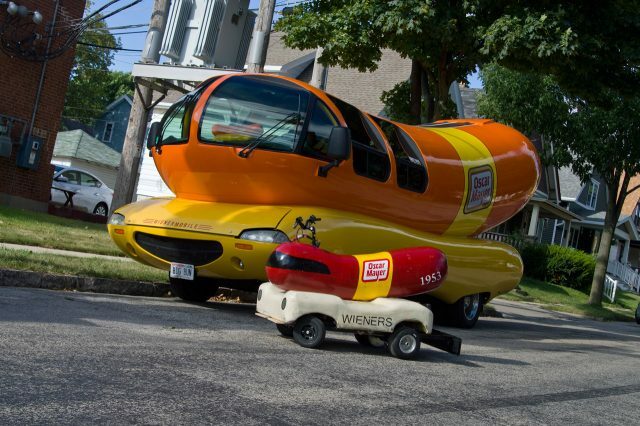 You may notice the two Wienermobiles look quite a bit different. 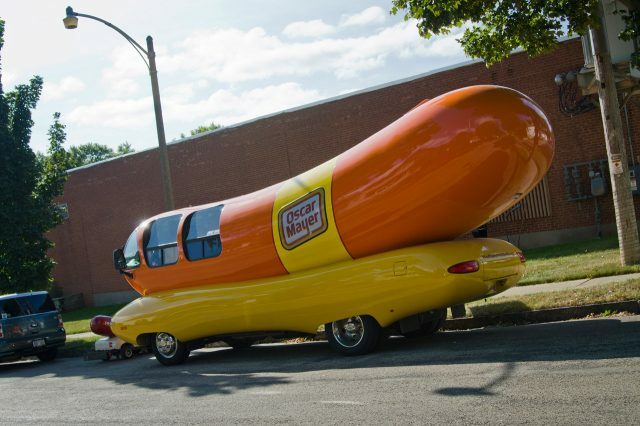 Well, there have been many different Wienermobiles over the years. Due to some confusion about which model we based ours on, we looked at the fact that the vehicle was designed by Carl G. Mayer in Madison, Wisconsin, in 1952 and received its patent in 1954. So we split the difference and chose number 1953. Good Enough! 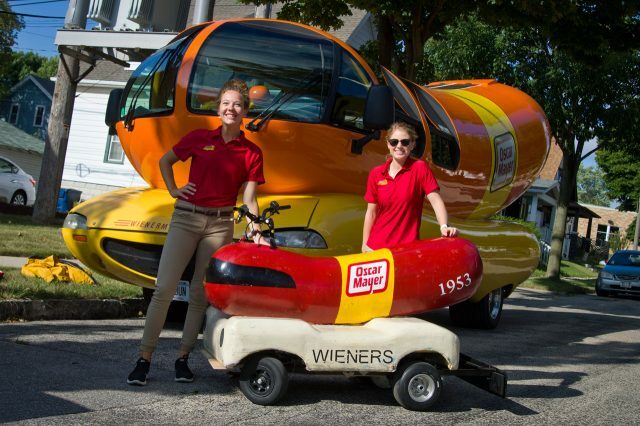 Honey Mustard and Sammie Jo (yes, the “Hotdoggers” get cool nicknames) loved our little version of the Wienermobile, and we gave them a quick tour of the space, explaining what a makerspace is, and how it works, and showing off Willie’s boat for the very last time. 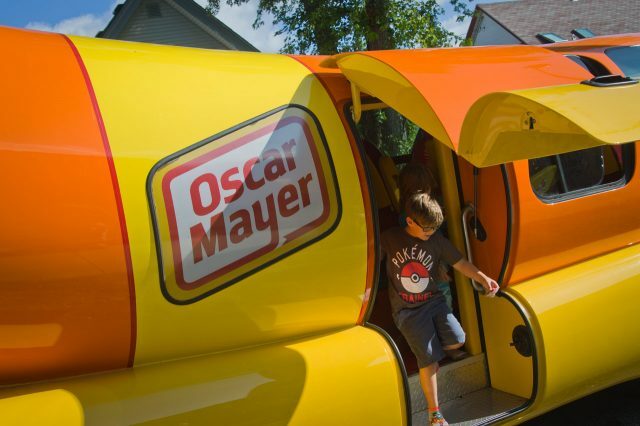 Besides all the awesome members who showed up to meet the giant Wiener, we should have a shout-out for Rick, who was busy grilling up Oscar Mayer wieners for us! We all had an early lunch that day, and everybody got to grab a wiener. What can we say? We like big buns and we cannot lie! 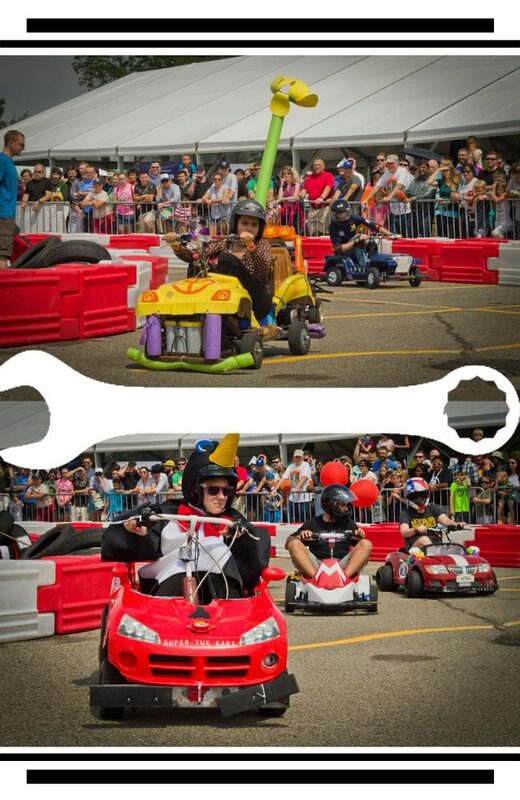 If you haven’t seen the little Wienermobile in action yet, make sure you visit us at Maker Faire Milwaukee on September 23rd & 24th, 2017 at the Expo Center at State Fair Park. 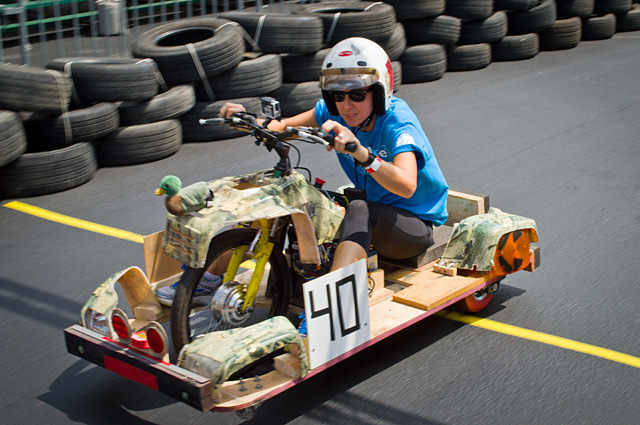 We’ll be racing it against 15 other similarly weird and wild vehicles in the Power Racing Series. And who knows? 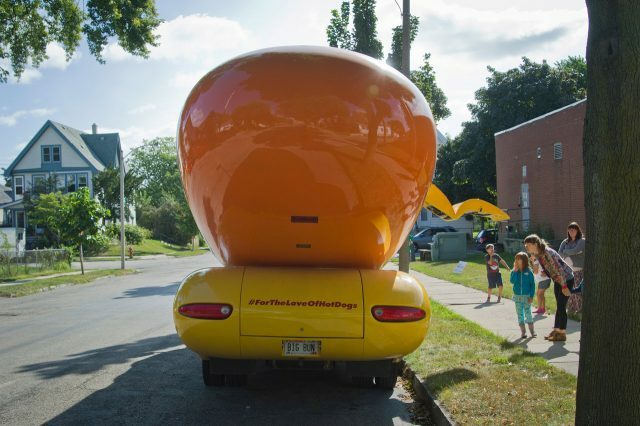 Maybe the big Wienermobile will show up again! 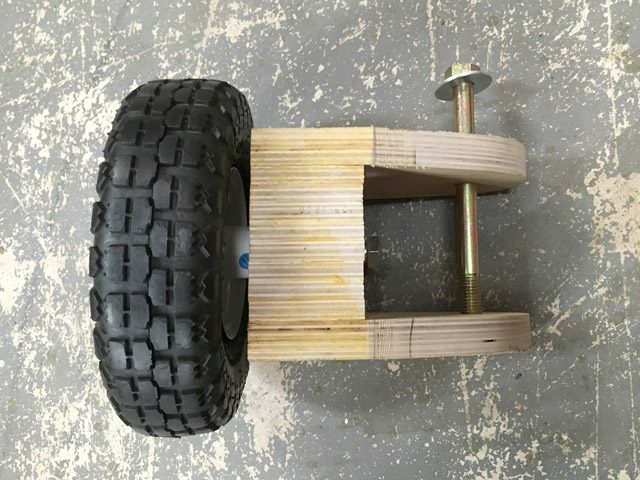 While most teams in the Power Racing Series just buy pre-made spindles and weld them in place, our “No-weld” spindles were built using wood, glue some staples/screws, and use some 5/8″ bolts to attach to the car, and for the wheels to attach to. You can find super-cheap (and even free) used Power Wheels cars on craigslist, and usually the batteries are dead and there’s no charger, which doesn’t matter, because we replace all that with more powerful motors, batteries, motor controllers, brakes, etc. Here’s the start of our frame. It’s all wood, glue, and screws. 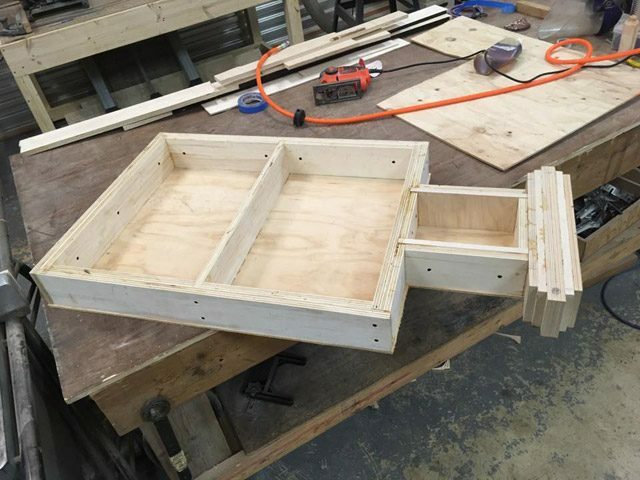 We’ve utilized a torsion box design for strength. So far we’ve only used a saw, drill, and some clamps. 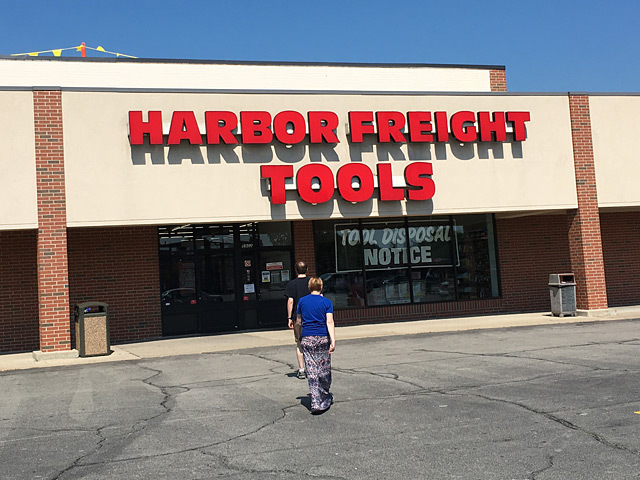 No specialty tools that are out of the reach of your common workshop. 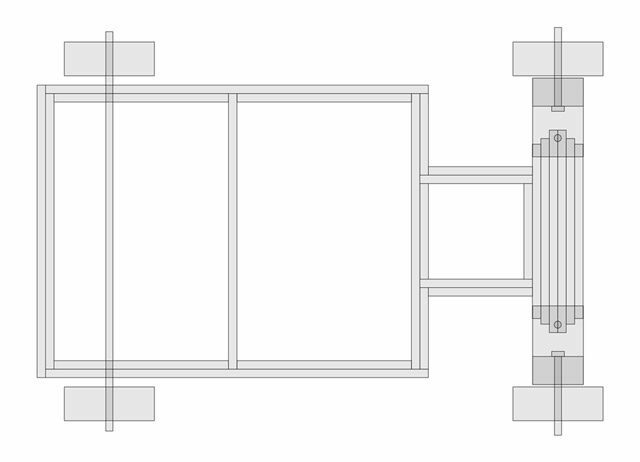 We’ve got a long way to go, but we’re going to try to make this car super-cheap, and easy to build, so that many teams (of kids and/or adults) could easily build it. As members of a makerspace, we may tend to forget that not everyone has access to the tools and skills we do. 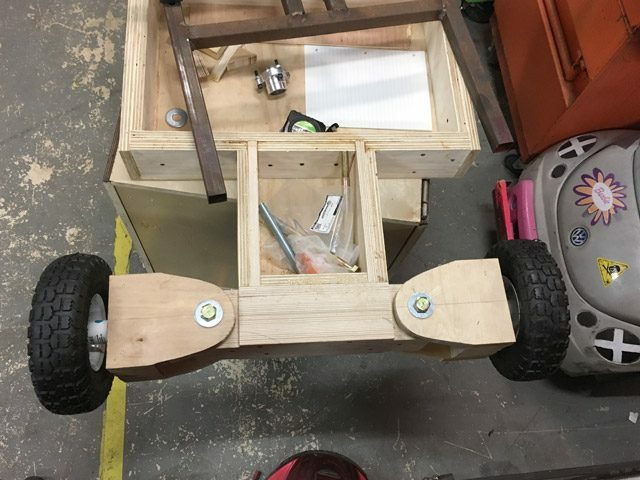 We’re also working on front wheel spindles build using wood and bolts. 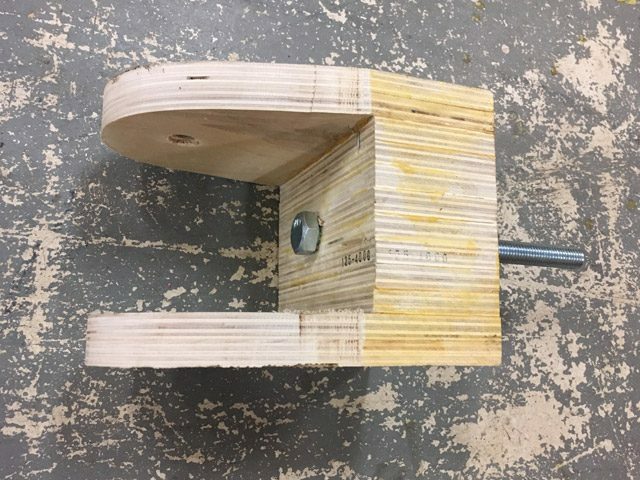 Yes, you can buy metal spindles for cheap, but a lot of what we are doing is experimenting with materials and geometry, which should provide some valuable lessons along the way, and it should be cheap/easy to modify things, try-test-try again, and see what the outcome is. 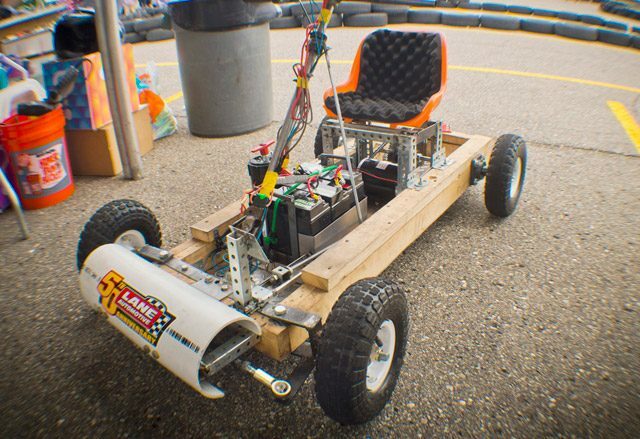 You can check out more about this project on the Milwaukee Makerspace wiki. We’ll do our best to add updates as we go. 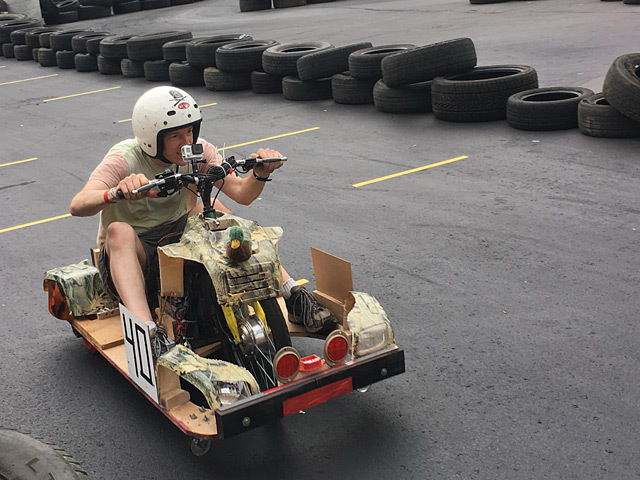 Hopefully this thing will be ready to race in June at Maker Faire Kansas City! Duallies again! Brings back memories of Red Lotus, doesn’t it? But this time we did not destroy any pink tires. We destroyed other things, but we fixed most of them. 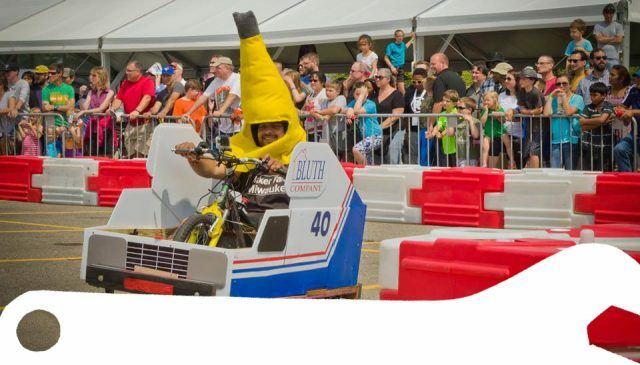 Lori (aka “The Lorry”, aka “The Truck”) has raced before in Kansas City, and it was good to have her back behind the wheel, er, well, handle bars… Unless you count the main drive wheel when we say wheel. Yeah, let’s talk about that bicycle hub motor that runs at 24 volts, and not 36 volts. 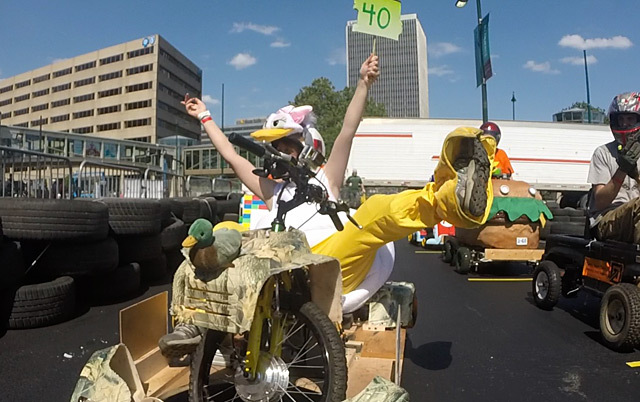 Kathy went full-on duck, but can you blame her? 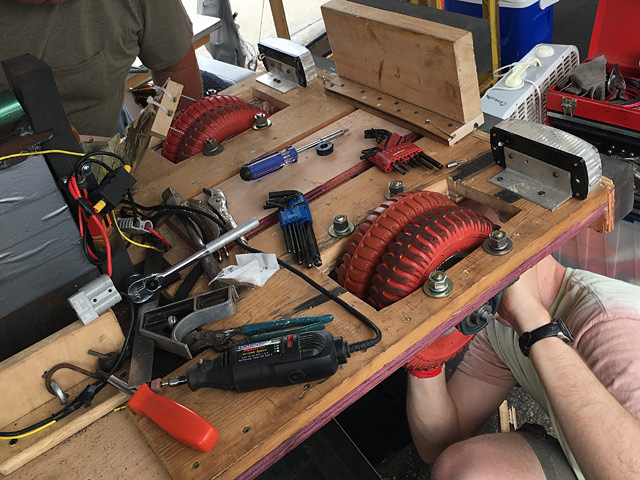 About that hub motor… It’s built for 24 volts, but after the controller malfunctioned we switched it out for a 36 volt controller, which would only work with 36 volts attached to it, so we added a third battery and went crazy. Things worked until they didn’t and the motor burned up, even though we kept pouring water all over it. Drat! Well, that’s the way it goes in the PPPRS, you either taste victory or you smell things burning. 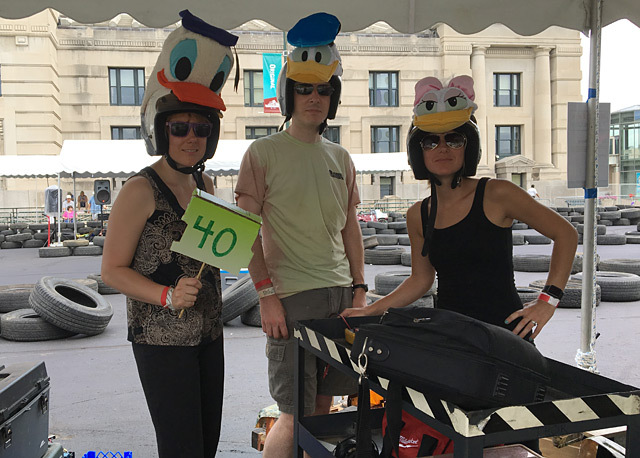 We did manage to get within the top five during the Endurance Race, and maybe even hit second place at one point. It’s all a blur really, and honestly we care more about having fun than we do about winning.